The strong pace of growth in nonfarm payrolls suggests much more than a rebound from bad weather. While recent economic figures have been generally mixed, the job market is clearly improving, led by increased hiring at small and medium-sized firms. The hope is that good news will feed on itself, lifting the pace of growth in the second half of the year. However, there are a few concerns in the outlook. Small and medium-sized (essentially, newer) firms typically account for more than their fair share of job growth in an expansion. These firms have been restrained in the recovery, but demand appears to have improved to the point where many of them must hire new workers to keep up. Prior to seasonal adjustment, nonfarm payrolls rose by 582,000 in June (education down 847,000, but up 1.429 million otherwise), up 3.8 million since February. That’s a pretty good spring. 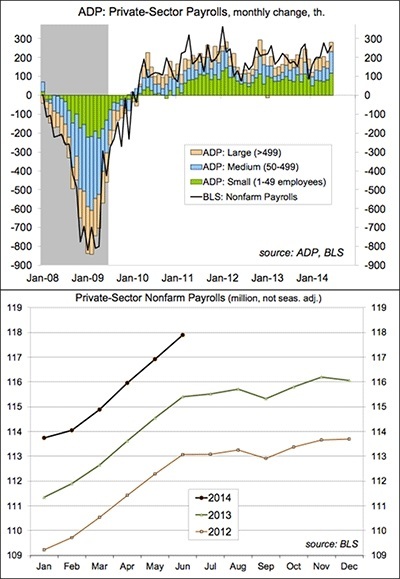 Note that unadjusted private-sector payrolls usually trend only gradually higher in the second half of the year. The unemployment rate fell to 6.1% in June, the lowest since July 2008. The employment/population ratio rose modestly and has been trending only gradually higher over the last year. The aging of the population suggests that we’re unlikely to get back to the pre-recession level on employment/population, but we should be able to make up at least two-third of the ground lost. 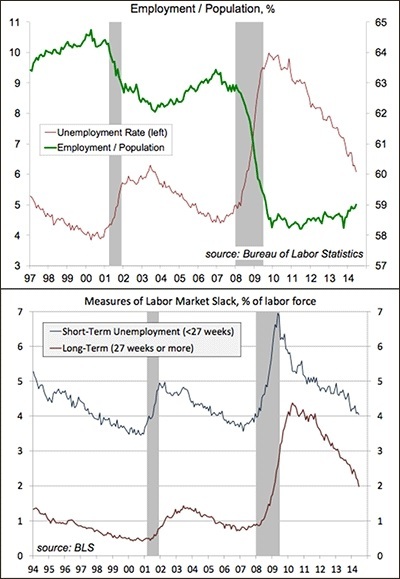 We still have a large amount of slack in the labor market. Short-term unemployment has returned to normal levels, but long-term unemployment remains elevated. There are three concerns in the economic outlook: 1) wage growth has remained low, limiting the potential upside for consumer spending growth; 2) geopolitical tensions could escalate, boosting gasoline prices and increasing the degree of caution in business hiring and capital spending; 3) there is little scope for expansionary fiscal or monetary policy should that be needed. However, strong job growth may be sufficient to boost consumer spending in the near term, which in turn, would lead to even more job growth in the second half of the year.